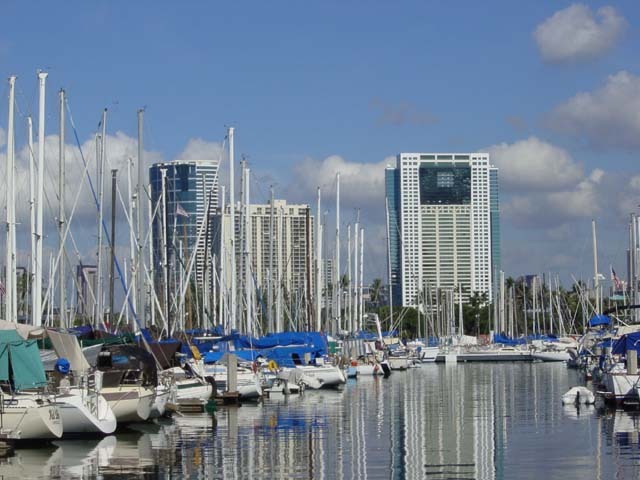 On April 5, 2019, the state of Hawai‘i issued a request for proposals (RFP) from developers to redevelop sections of the Ala Wai Boat Harbor in Honolulu. The area designated for revitalization includes a former boat repair facility, parking lots near the Hilton Hawaiian Village lagoon, the harbor office, and a former fuel dock. The proposed work must reinvigorate maritime activities, pedestrian access, and take into consideration sea level rise. The state seeks qualified and interested parties to lease and redevelop four non-contiguous parcels and limited redevelopment of two moles (the extensions of land piers are attached to) of state-owned fast or filled lands within the Ala Wai Small Boat Harbor situated at Waikiki. The DLNR Division of Boating and Ocean Recreation (DOBOR) is offering an up to 55-year-long lease for about 11.16 acres of land subject to the approval of the Hawai‘i Board of Land and Natural Resources. Photo courtesy of Ala Wai Boat Harbor / Steve Harris.